Under the Americans with Disabilities Act accessible parking spaces are required for each parking facility on a site, such as lots and garages. Requirements apply equally to public and employee or restricted parking. * At least 1 of every 6 accessible spaces or fraction of 6 must be vans-sized. Accessible spaces are required in parking facilities with valet parking because vehicles specially equipped for persons with disabilities may not be easily used by others. Further, valet parking may not be available at all hours a parking facility is open. An accessible passenger loading zone also is required at facilities with valet parking. Accessible spaces are required where parking facilities are altered or added. The term ‘alterations’ includes resurfacing of vehicular ways. Resurfacing or resealing and projects that add new parking spaces constitute alterations (or additions) and must include accessible spaces as required in the scoping table. Normal maintenance, such as pothole repair, surface patching, or repainting in place existing striping for a few spaces, is not considered an alteration except where it affects a facility’s usability. Where parking serves multiple entrances to facility, accessible spaces must be dispersed among accessible entrances. (If the number of accessible entrances exceeds the number of accessible spaces, additional accessible spaces are not required). 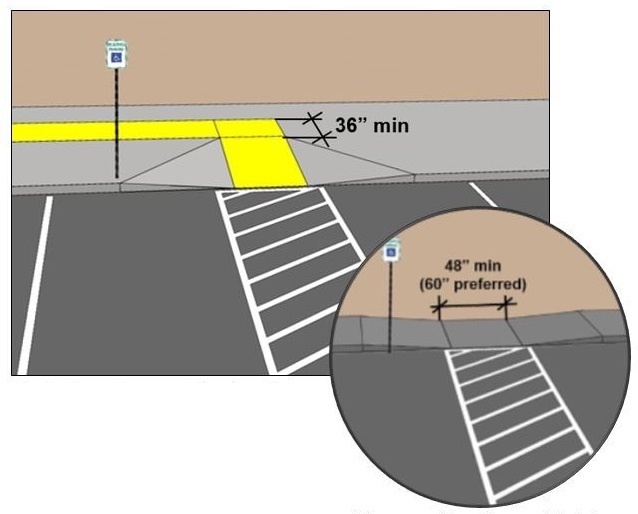 Accessible parking spaces must be located on the shortest accessible route to an accessible entrance, relative to other spaces in the same parking facility. 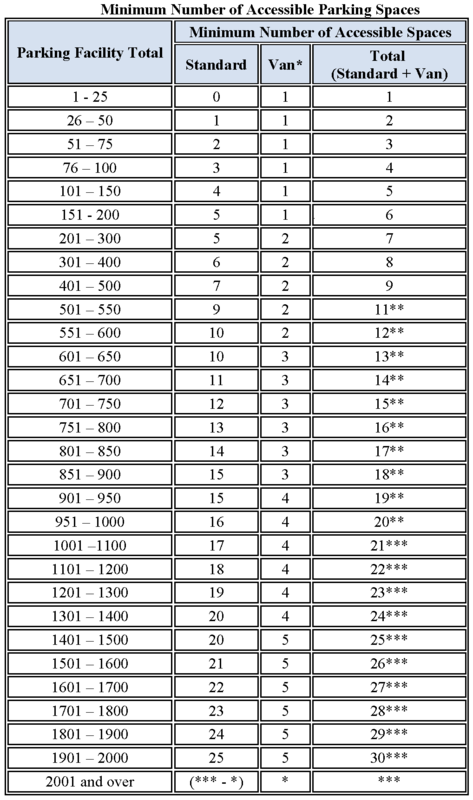 A maximum travel distance is not specified in the Standards. Where space for curb ramps is limited, including in alterations, parallel ramps can provide an alternative. Spaces must be marked to define the 96" minimum width. 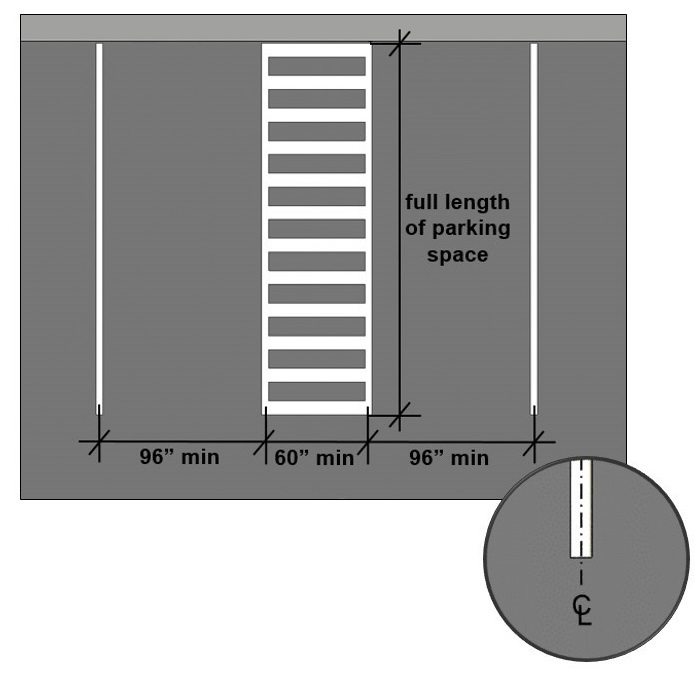 An access aisle at least 60" wide and at least as long as the parking space is required on either side of the parking space and must be marked to discourage parking in it. Two spaces can share one aisle. Access aisles cannot overlap vehicular ways. 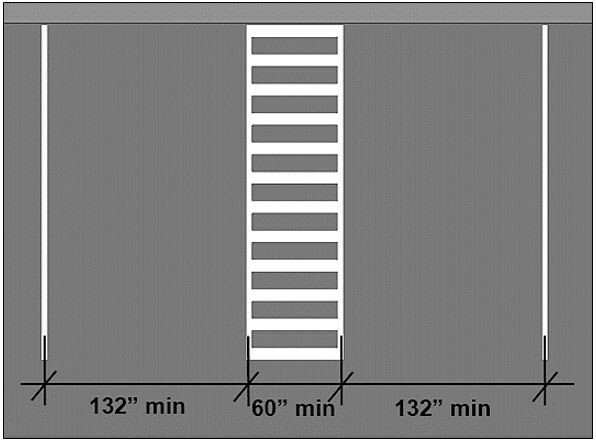 Parking spaces and access aisles must meet requirements for floor and ground surfaces (Section 302) and cannot have changes in level other than slopes not exceeding 1:48. Both the parking space and access aisle must be marked. The marking method and color is not specified in the Standards, but may be addressed by state or local codes or regulations. 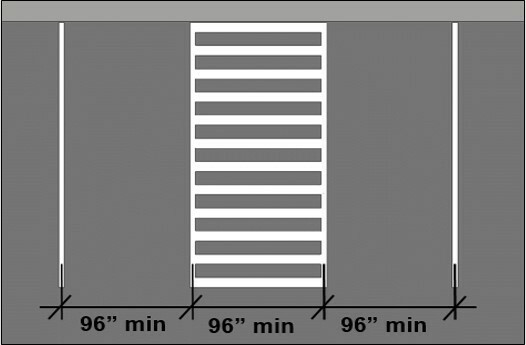 The width of spaces and aisles is measured to the centerline of markings (but it can include the full width of lines where there is no adjacent parking space or aisles). 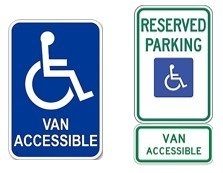 The van accessible designation is informative, not restrictive, in identifying spaces suitable for vans since such spaces are not limited to vans only. It can be included on the main designation sign or provided on a separate sign.